Make sure your precious seedlings and plants are protected from the elements. 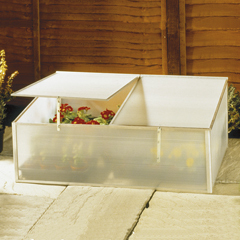 Glazed with opaque twin-walled polypropylene this cold frame features twin removable lids which also have adjustable stays to give you full control over the temperature and conditions. Pleae note clips to keep the lids closed are not included. 100x63x39cm high. We think these guides might be of interest: Cold Frames, Garden cloches.